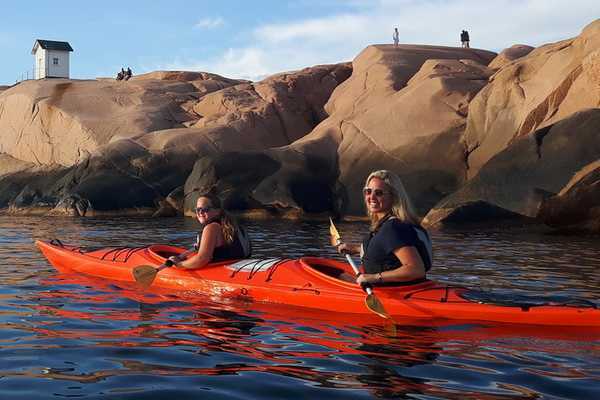 Outdoor West offers guided tours 2 - 4 (6) hours, in calm waters near the town Lysekil. Our outdoor equipment is adapted to beginners and intermediate paddler without previous experience from ocean kayaking. Furthermore we will spice up your experience with local flavours, both local food and local lore. Our tour leaders and guides love sharing their devotion to the county of Bohuslän: the rugged crags, fjords, salty meadows and the sea. We invite you to discover the best of Bohuslan: the food, the people and one of the world's 10 most beautiful archipelagos. Our guided tours are booked online. Departures (time and day of the week) may vary depending on the season. Would there be contradictory information at any time, it is the booking system that takes precedence. There will be no binding booking until the payment procedure is completed and basket has been checked out. Would we need to cancel a tour (due to strong winds etc) there will be a refund to the credit card used for payment of the booking and participants will be notified at least 2 hours prior to scheduled departure. However, we always try to offer an alternative activity that is less dependent on the weather. Together with booking confirmation you will receive information on how to dress and what to bring, i.e. spare (reinforcement) clothing. On some tours there will be a minimum number of booked guests in order for the tour to run. In such a case the amount will be reserved from your card, but it will not be charged unless the required number of guests have booked. Our 4 hour tours are designed for participants that look for a combination of leisurely paddling and getting to know the local culture. On tours that are longer than 3 hours a complimentary outdoor meal is an imortant feature of the tour. Short tours (2 or 4 hours) are suitable to everyone, regardless of previous kayaking experience. Normally we use K2/tandem kayaks with 2 separate cockpits, as a means of pfoviding optimum stability and seating comfort. Would you like to paddle alone in a K1/single kayak you can book this as an addon for a small surcharge. Security, care and enjoyment are key words when we plan our activities and trips. Every tour starts with a breefing and relevant information on technique and safety procedures. No prior kayaking experience needed, but you must be able to swim 200 meters and have "normal" health (feeling well). If in doubt, please consult with your regular physician if the two of you can asses that you are able to exert moderate physical labour. 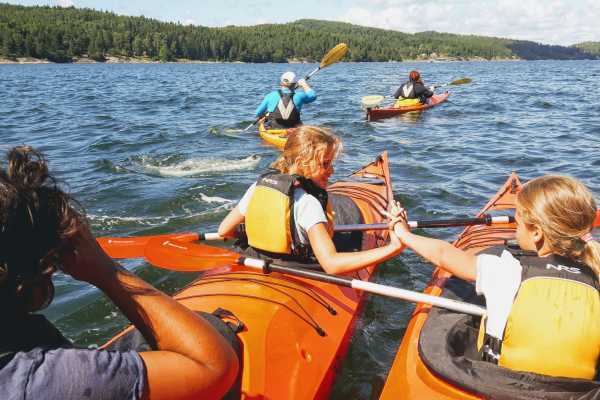 A prerequisite for participation on longer tours (5-6 hours) is that you have enough previous experience of kayaking to assess that you are able to spend a few hours sitting still in a kayak in addition to a regular level of fitness. For more info on each activity: click BOOK NOW! To see day and time of departure on each activity: click BOOK NOW! We offer rental service for shorter and longer tours paddling on your own. 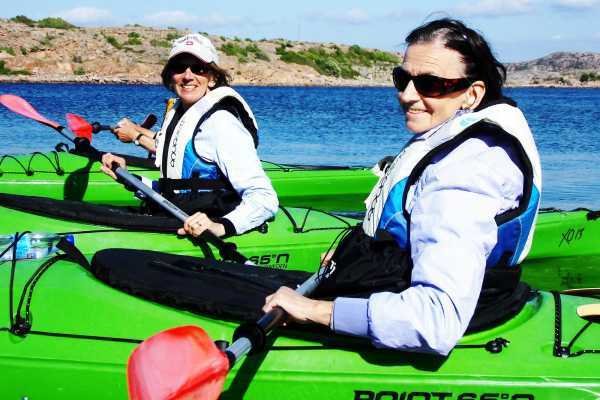 If you are have no previous experience of sea kayaking we suggest you join a guided tour, or book a crash course. Book your kayak rental here. Please note that the coastal weather can change in an instant. The direction of wind and waves can change during a short break, especially at mid day. Do not over estimate your own skills and the ability to handle emergencies among companions At least one person in every party ought to have experience in leading and execute rescue and recovery procedure of a companion that has capsized. Adjust your route in accordance with the level of proficiency of the least experienced member of your party. As we are situtated on the tip of a peninsula with only a few skerries between us and the North Sea Lysekil can be eposed to foul weather. This means that we sometimes have to relocate the time or place of departure for a guided tour in order to keep our guests comfortable and confident. It is always the activity leader who has the ultimate say whether to abort or cancel an activity. Our ambition is to always be able to offer an alternative activity that is less weather depending. One such example is offering kayaking for climbing guests if there is a light rain, or offering cykling or climbing to kayakers if the wind is to strong. Such alterations however are always communicated in advance. Kayak tour running in calm, sheltered waters in one of the world’s most beautiful archipelagos (according to a recent CNN listing). You’ll find yourself in “Wilderness light”, after only a few minutes of paddling. Nature reserves Stångehuvud, with smooth granite crags, and the Gullmarsfjord, are just around the corner. Learn more about herring (Clupea harengus) and its importance to the Bohuslän region in the past - and enjoy an open-air herring meal. 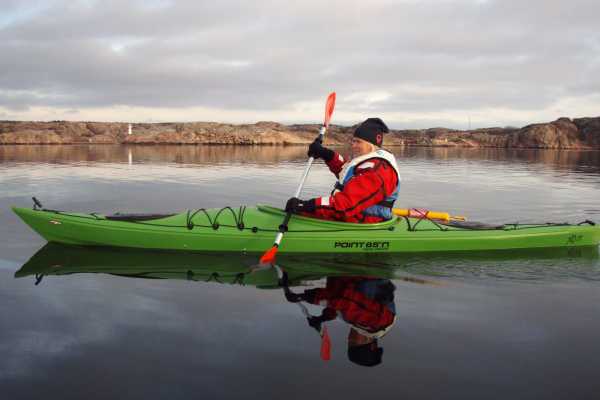 A stable sea kayak and dry suit makes you enjoy the moment even more! Please click BOOK NOW! to learn more and to see available departures LOCATION: LYSEKIL Season: May-September Recommended for: Everyone (Soft Adventure) Requirements: Regular health, able to swim 200 meters Min age 13 and min height 160 cm What’s included: Guide, seat in a shared K2 kayak, outdoor meal What to bring: Headgear, reinforcement garments for the break, sunglasses, (retainer for glasses), water (0.75L, to store on top of kayak) Duration: 4 hours total (2.5-3 hours seated in the kayak) Price: SEK 900 Optional: Single seating in K1 Kayak Lysekil in Bohuslän is perfect as a base for adventures at sea and on land. Outdoor West arranges comfortable, safe and challenging experiences at different levels in this area.